What Is the South Coast Air Quality Management District (SCAQMD)? See bottom of post for video. Today, we’re going to talk about the first of two of the most important reports that need to be prepared and submitted under the EPA’s Title V program, the semi-annual monitoring (SAM) report. The second, the annual compliance certification (ACC) report, is discussed in the next post, although the video at the end of this post covers both. 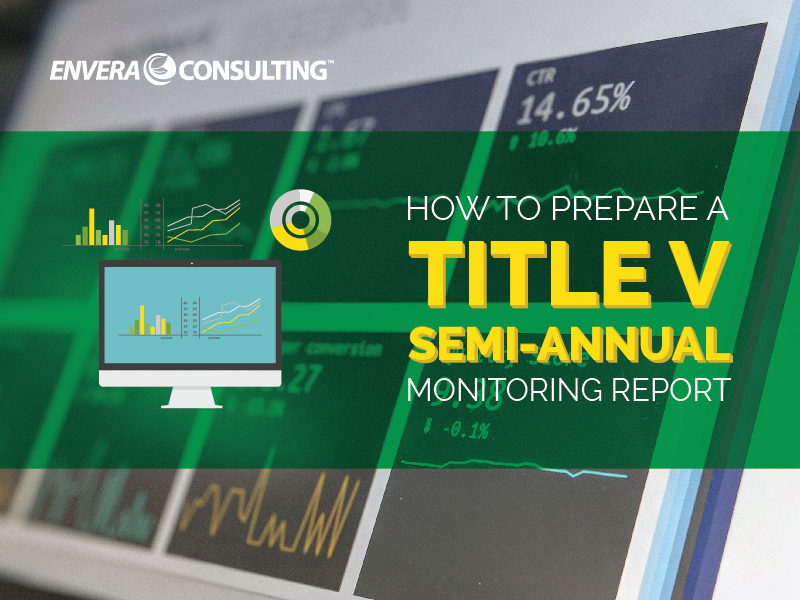 Although other reports are sometimes required for Title V, this post will cover just two of them — the semi-annual monitoring (SAM) report and the annual compliance certification (ACC) — which comprise the general requirements of the Title V program. Let’s start with the semi-annual monitoring report, known within the industry as the SAM report. The SAM report is due to both the EPA and the SCAQMD by February 28, which allows the report to cover the most recent reporting period (July to December). If your monitoring period is from January to June, then you need to submit the SAM report by August 30, 60 days after the end of the reporting period. The SAM report is simply a summary of whether or not the facility has completed all of the monitoring required by the terms and conditions noted in the permit during the reporting period. This is done by reviewing your facility’s monitoring reports for deviations or other anomalies (i.e., non-compliance), such as excess emissions, breakdowns, or emergencies, that occurred during the reporting period. It’s important to note that the SAM is submitted in addition to reports that are required by other rules. For example, many Title V facilities are also part of the Regional Clean Air Incentives Market (RECLAIM) Program, which has its own set of required reports. Or perhaps you have a non-RECLAIM continuous emissions monitoring system (CEM), which might require reporting under Rule 218. Most stationary engines requiring reporting under Rule 1110.2. All of those reports are in addition to the SAM. Was all the motoring conducted? Were there any deviations associated with operating that piece of equipment during the reporting period? Due to the reporting due dates, many facilities only review their data twice a year. But that’s not always the best policy. When you look at the data on such an infrequent basis, you run the risk of having repeat deviations that you don’t catch until you review the data. Let’s say a facility has a deviation in July, August, September, and October and, after those four months, the deviation sort of corrected itself. If no one looks at the data on a periodic basis, the only time you might discover those four deviations is when preparing your SAM report in January. And when it comes to Title V, repeat deviations equal red flags, meaning the agency might scrutinize you a bit more than it otherwise would have. So monitor your data on a regular basis and take corrective action on any deviations ASAP! Preparing a SAM report can be boiled down to three steps, although it could be more or less depending on your facility type. There could also be a lot of data too to review. Note that once the SAM is submitted, it becomes part of the public domain — which means that anyone can pull up your report to see if your facility is in compliance and, if you’re not, the public has the right to file a lawsuit. So while you’re going through the first two steps listed below, compile a detailed inventory of any anomalies and their related analyses. You won’t submit this backup file with the SAM, but you’ll want to keep it in a safe place back at the ranch — just in case. Step 1: Determine if all monitoring was completed as required by your permit. This requires you to review the conditions associated with each piece of equipment and identify the conditions that you need to be monitoring. Once that’s done, you need to visit the plant to see if that monitoring data is there. The more equipment your facility has, the more conditions and data you’ll have to review. Step 2: Determine the compliance status of your equipment. Look at the data in comparison to the limits noted on the permit and determine whether each piece of equipment was operating in compliance during the period. If you had any instances of equipment breakdown, you should have a notification number that you received after reporting the incident to the SCAQMD. Any such reports need to be included in the SAM. You also want to look at any instances of excess emissions during emergencies or breakdowns. All of those instances need to be wrapped into the SAM report. Step 3: Prepare the necessary forms. See our next post for how to prepare an annual compliance certification report. Want More Environmental Compliance Tips? Ensure you stay in compliance by getting news and updates delivered right to your inbox. Sign up for the Envera newsletter. Grant is a principal at Envera Consulting. As the Sherlock Holmes of environmental consulting, Grant solves current-day problems using modern tools. More on Twitter or LinkedIn. Get weekly tips and news on California’s air quality regulations right in your inbox. Let Envera Consulting help you navigate your business to compliance.